In a well engineered system ("you have a problem but know-body else does") focus on alignment, abrasives in the system, and shaft surface finish. When the rocker arm is stationary, lubricant is squished out from between the shaft and bushing. 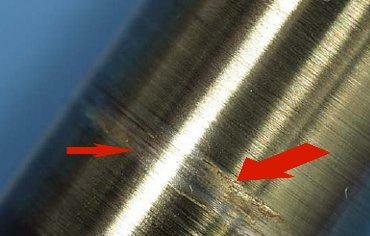 Metal-to-metal contact occurs along a line where the shaft contacts the bushing.1. This is called "boundary lubrication". 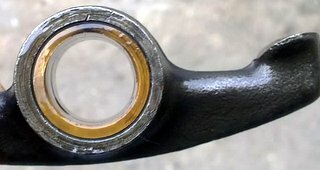 As the rocker arm moves, oil is forced between the shaft and bushing separating the surfaces.This fluid film prevents metal-to-metal contact. You can see the progression from boundary lubricant to fluid film (hydrodynamic lubrication) in the bushing wear pattern. At first the contact is full but progresses to a feathered edge. For the lowest wear, we want to maximize fluid film lubrication and minimize boundary lubrication. The gap or clearance between the shaft and bushing allows space for the fluid film. As will be discussed below, if the shaft wears into the bushing the effective clearance decreases. Without clearance, the oil cannot penetrate between the shaft and bushing even though plenty of oil might be covering the shaft and rocker arm. Without an oil film the boundary lubrication region increases resulting in increased contact between shaft and bushing. This increases wear. In a boundary lubrication system where there is direct contact between the shaft and bushing, shaft surface finish is critical. Any shaft roughness cuts into the bushing. Replace any rough shafts regardless of dimensional limits. Locking down the shaft prevents it from rotating in the boss (early engineers knew better) if the friction between the shaft and rocker arm are excessive. A floating shaft rotates where the friction is lowest, which can be at the boss if for some reason (friction, abrasives, seizing) occurs between the rocker arm bushing and shaft. Friction and wear are reduced in a floating shaft configuration. When the shaft wears into the bushing, clearance is reduced as the effective bushing diameter conforms to the shaft diameter (shaft falls into the divot), contact area between the shaft and bushing increases. This increases the area of boundary lubricant and reduces fluid film lubrication. It also prevents heat transfer and washing away of abrasive particles.The lubricant film is further reduced. The hardened shaft can wear without the bushing wearing. This is typically caused by abrasive particles embedding themselves into the bushing and then scoring the shaft. This is called "3-body wear" as a 3rd body, the particle is required. Particles can be dirt or contamination or burrs broken from a rough shaft. Incompatible materials. Example is the use of Aluminum Bronze bushing with rough surface finish. 2-body wear. Adhesive wear from high-spots creating enough friction and heat to cause micro-welding. Relates to surface finish and oil supply. Excessive shaft pressure - alignment and fit. Incompatible materials - entire population of bushings affected. Substitution of aluminum bronze for leaded bronze caused fuel pump galling, shaft breakage and the loss of all aboard Cessna-404 VH-ANV. Too little clearance between shaft and bushing - binding and seizing. Fix the damage. Replace both shaft and bushing. Correct the problem. Inspect for contamination, inspect alignments, fits, and clearances, do a manufacturer literature research and contact the manufacturer service department for suggestions. Might be a service bulletin correction. Check for proper parts and proper repair process. Monitor wear for the next few hours. 1. The theoretical contact between one cylinder (shaft) nested inside another cylinder (bushing) is a line but in practice the applied load causes elastic deformation of the bushing so that the contact area is rectangular. This creates shear forces in the bearing material. Two methods of decreasing applied loads and shear forces is to increase the contact area by reducing shaft clearance and by reducing friction by using a smoother shaft finish. Reducing clearance is not without problems as this reduces the oil film and consideration of thermal expansion might result in shaft binding.